Are you bored of using the same oil for cooking every day? Flavored oils can be a wonderful way to add a zing to your diet. Preparing them is fun. Sparing a Sunday afternoon on these flavored cooking oils is worth all your effort. Most interesting part about these oils is the smooth richness that brings out a luscious mouth feel to the dishes. These oils are very easy to prepare but are inexpensive. • Add your own spices like cinnamon, star anise, cloves, pepper corns, cumin or herbs like oregano, basil, dill or thyme flavors. Garlic or dry chilis are the best flavoring agents. Use either fresh or dried herbs. 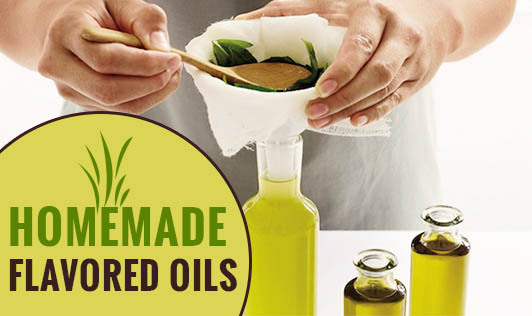 • Try to use mild oils like sunflower or canola oils; even olive oil can be used. Try avoiding very strong flavored oils like mustard or sesame oil because the flavor of the spices can be masked by these strong oils. • There are two processes of making infused oils- Hot infusion and Cold infusion. Either way, flavor remains intact. • In infused method, herbs or the spices are soaked in the base oil which lends the flavor to the oil. In hot oil infusion method; the herbs are heated in a small quantity of oil. After cooling, the required oil is poured onto to the herbs. In both these methods the oil picks up the flavor very fast and intensifies over a period of time. For mild flavor, keep the herbs/spices for short period or for an intense flavor keep it for longer period. • If you are going for spice blends, both whole spice and ground spice work fine. Whole spices and herbs can be left in the oil for decoration. They will keep strengthening the flavor over time. If you are using ground spices strain them with a muslin cloth before bottling them. • Bruise the herbs and spices to release their flavors. • Place them in the bottle. • Cover and let stand for 2 weeks. If the flavor isn't strong enough, add more flavorings. Once the oil is infused, keep the oil refrigerated. The oil should last for up to 2 months. You can choose to flavor your oil with one type of infusion, and you can use a combination of spices. End product of flavored oil is worth all the effort you put in. These oils add flavor to vegetables, fishes, meats and also are great bases for salad dressings, marinades, and sauces. Bottles of infused oils look great on kitchen shelves, and are always an impressive gift to your friends and family.